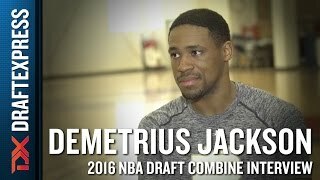 Notre Dame point guard Demetrius Jackson works out in preparation for the 2016 NBA Draft in Chicago. After reaching the Elite Eight behind strong play of ACC First-Team All-Conference and eventual Top-20 draft pick Jerian Grant in 2015, Notre Dame handed the reins to the point guard position to rising junior Demetrius Jackson. Jackson led Notre Dame back to the Elite Eight, behind plenty of late game heroics, and won Second-Team All-ACC honors, prompting him to declare for the draft while being projected as a top-20 pick himself. What Jackson lacks in height (standing somewhere around 6'0 barefoot, possibly less) he makes up for with a chiseled frame, a 6'5 wingspan and tremendous athleticism. He's a powerful guard blessed with excellent quickness and elite-level leaping ability off one or two feet, allowing him to regularly make highlight reel plays, sometimes on the receiving end of lobs. Jackson's 3-point shooting fell off in a significant way from his sophomore (43%) to junior (33%) season, a product of how much more he was tasked with handling the ball and creating his own offense as the engine of Notre Dame's methodical, but efficient attack. Nevertheless, he's a career 38% 3-point shooter, and is capable both shooting with his feet set and off the dribble, with good mechanics and the ability to elevate and create separation to get his shot off the bounce. Jackson's consistency shooting off the catch (41% with feet set--Synergy) allows him to see time operating off the ball, which gives his coaching staff nice flexibility in how to utilize him and his teammates. He's very good out of the corners, and moves off the ball intelligently, something he has experience with spending two years sharing a backcourt with another PG in Jerian Grant. This is a major positive in today's NBA, where almost every team likes to utilize multiple playmakers in concert for significant portions of the game now. Jackson's strong frame, quick first step and ability to operate at different speeds gives him great potential as a pick and roll, isolation and transition playmaker/scorer as well, even if he's far from reaching his maximum effectiveness in this area. He tends to kill his dribble in traffic far more than you'd hope, looking somewhat indecisive or even passive probing the defense and using his blazing speed to his advantage. He shows great flashes in this area at times, using a low and tight handle to create space and weave in and out of traffic with short, choppy strides, and a powerful first step to blow by defenders and get to the front of the rim, where he can finish through contact very effectively. He only does this inconsistently, though, as it seems he hasn't quite figured out how to fully unlock this part of his game, instead operating in the third gear and being caught between overpassing and overdribbling in a very vanilla style. Some of this may be due to Notre Dame's system, as it wasn't rare to see his head coach put the brakes on him from half-court, and he never really seemed to earn the same kind of leash that we saw Jerian Grant enjoy last season for example. There's no question he would have had the green light, playing in a proven and elite offensive system, if he'd shown he could be trusted in that role. It's not a stretch to say that Jackson is still figuring out the nuances of the point guard position, as he isn't the most natural playmaker at the moment, displaying average court vision and savvy and missing some easy reads at times due to his lack of size. He's not a guy that will whip the ball all over the floor with crisp passes, and he struggles to use re-screens and will generally make some questionable decisions at times. Defensively, Jackson's swift hands, quick feet, long arms and strong frame gives him a good baseline to develop into an above average stopper in time, despite his lack of size. Unfortunately he doesn't use this consistently to his advantage, as his effort level seems to waver at times, he can be very upright in his stance, and he doesn't do a great job of getting over and through ball screens. This was hardly something that was unique just to him on Notre Dame's squad, as the Irish defense ranked at the bottom of the ACC this past season. Jackson will likely be asked to put significantly more emphasis on this part of his game in a smaller role in the NBA, certainly early on, and he has the tools to be very effective here if he puts his mind to it. While Jackson has some weaknesses, it's difficult to find point guards who display the same level of potential he does as a shooter, scorer, playmaker and defender, especially with his athletic tools. Many of his deficiencies are things he can continue to work on, and by all accounts he has the type of intangibles you look for in a budding prospect that will be coachable about addressing his flaws. It certainly helps that this appears to be a fairly shallow draft class in terms of starting caliber point guards, which should give him a great chance to be invited to the Green Room on draft night. The purest distributor among the point guards in attendance, Demetrius Jackson (ESPN #21, Scout #28, Rivals #30) stood out with his passing and leadership. Standing 6'1, Jackson has solid size for a point guard and possesses the strength and speed to make a quick transition to the high-major level. A consummate floor general, Jackson looked first and foremost to use his ability to turn the corner and push the break to create opportunities for his teammates this week. Showing admirable unselfishness, Jackson displayed good court vision and sound decision-making as a passer. Also capable of scoring the ball, Jackson has nice mechanics on his jump shot and is a threat from the perimeter both off the catch and off the dribble when given space. He'll need to continue improving his consistency to reach his potential at the NCAA level. The Indiana native's size is a limitation when he looks to finish around the basket, but his speed, strength, and body control allow him to take advantage on the occasions he can get a step to the rim. With Eric Atkins entering his last year of eligibility, and Jerian Grant still in the fold, Jackson will get the chance to ease into a role with the Fighting Irish. It will be interesting to see how he fits in as a freshman and how he matures as a point guard before being handed the keys to Notre Dame's offense down the road.